[FTC Disclaimer] No compensation was paid for this post, and full price was paid for the products. We smoked a couple of hams over the holidays, and this one was a solid winner. I started with a smoked boneless ham. This particular one was an applewood smoked ham packed for Sam's by Smithfield. I like these or one of their Smokehouse Reserve hams when Sam's has them. They don't stock them all of the time but when they do we grab a few. I lightly wiped it with a little peanut oil, perhaps a tablespoon, and then seasoned it heavily with Gentry's Ham Bone BBQ Seasoning. This is a new rub, at least it is to me. 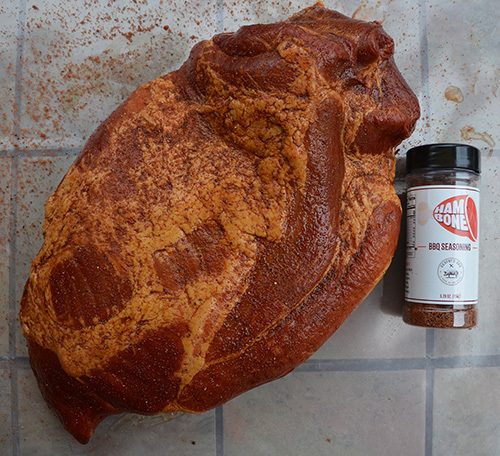 It is a sweet rub with the warmth of cinnamon and all-spice that pairs perfectly with ham. 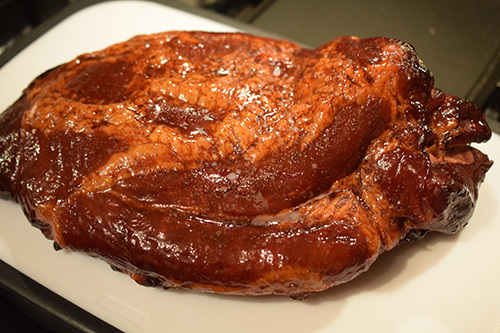 I smoked it with more applewood on a large Big Green Egg. I was using a spider rig/stone/drip pan combo. No particular reason for that versus a plate setter, it was just what I had nearby. I'm using Craycort grates as usual. I went at 275°f for about 1 hour and then foiled it for the second hour. 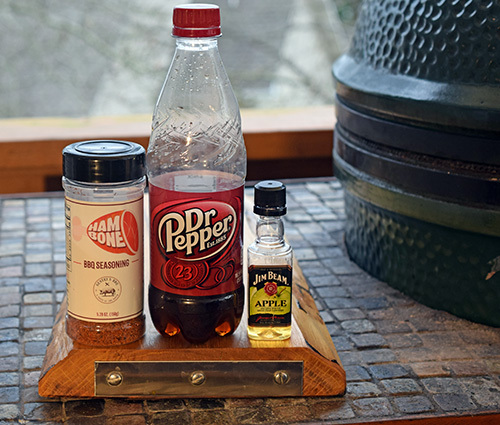 While the ham cooked, I made a thin glaze of more Ham Bone, Dr Pepper, and Jim Beam Apple. Alexis picked up that miniature at some point, and it seemed like a good use here. You could probably just use any bourbon, but the apple flavored bourbon worked well here. Add the Dr Pepper, brown sugar, honey, and Ham Bone seasoning to a medium stock pan over medium heat. Bring to a simmer and cook until thickened, 15-20 minutes. Add the apple flavored whiskey, to taste. Cook another 5 minutes. Remove and allow to cool before applying. 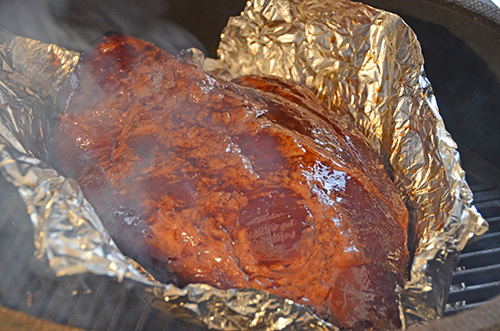 After 2 hours, I unwrapped the ham and applied the glaze a few times while I let it cook for another 15 minutes. After 15 minutes, I pulled the ham off of the grill. I let it rest to cool for an hour and then refrigerated it overnight. 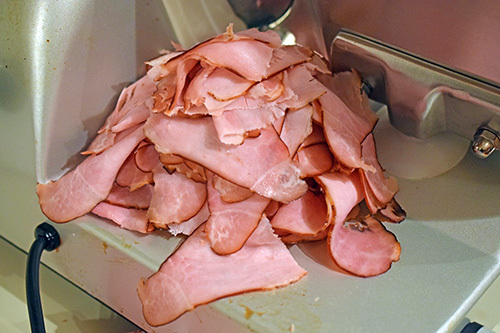 I sliced the ham on my meat slicer set just above "0" for these thin pieces. 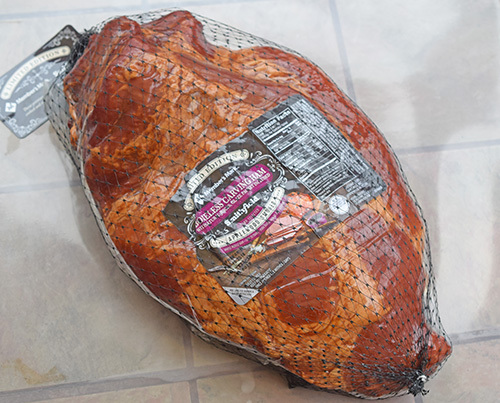 The 8-lb pound boneless ham yielded right at a half steam pan full. 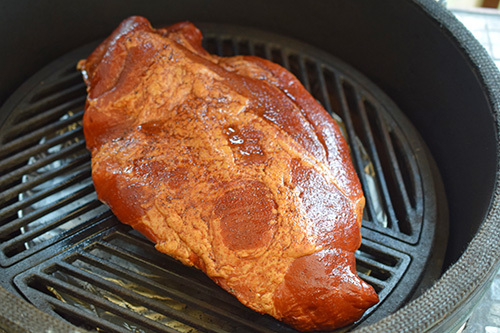 The Ham Bone and glaze brought out that classic blend of sweet, smoky, salty, and spicy warmth. 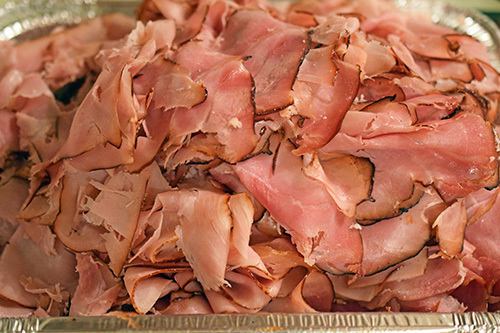 The piles of thinly sliced ham gave me a fierce craving for a taste of nostalgia. When I lived in Florida and would go surfing down in St Augustine, we would often stop at the Beachcomber at the A Street beach entrance. They had this killer burger called a Schomburger that was simple, big, and incredibly good. 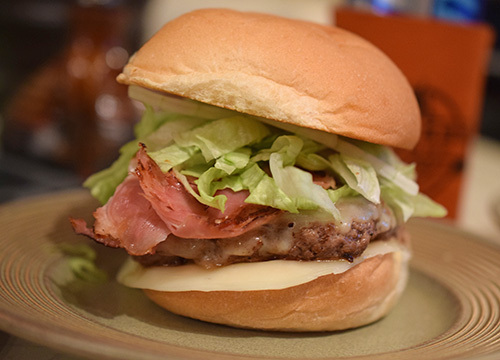 It was a 1/3rd lb bigger topped with Monterey Jack, griddled ham, shredded lettuce and paper-thin sliced onions. 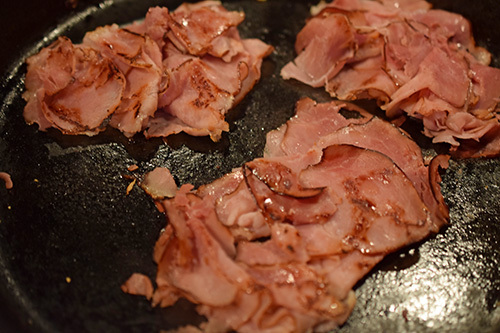 Cooking the ham on the griddle gives it crispy edges that add to the texture and taste of the sandwich. 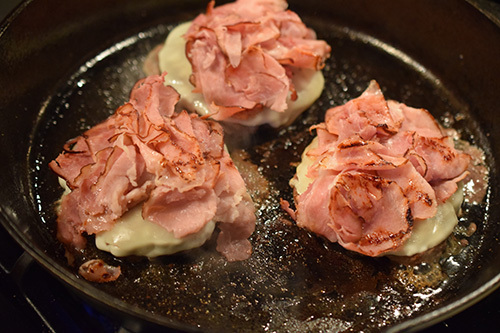 Third-pound ground-chuck patties seasoned with our NMT Beef Rub v.2, topped with cheese (we did provolone instead of Monterey Jack), and piles of griddled ham. The Schomburger will always be in my top five "best ever" burgers. I haven't been back to the Beachcomber in close to 20 years, so I had to Facebook stalk them. I was glad to find out that they are still open at the same location. They have upgraded the Schomburger to the Schom's Revenge Pt 3. They added bacon and pulled pork to the burger. Next time I'm down that way, I'll have to check out the "improved" version. But this taste straight from the page of my memories was just what I needed.